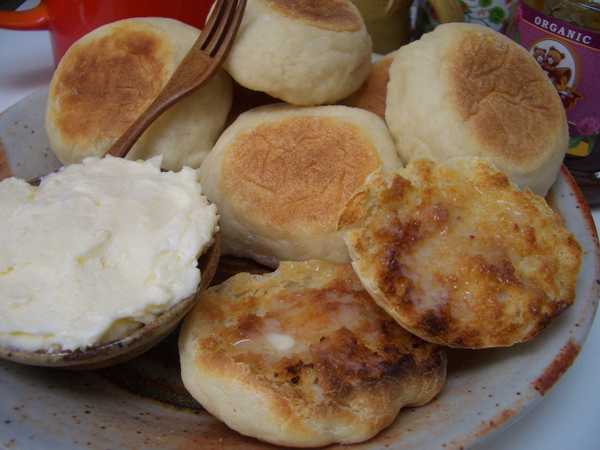 I’ve said before The Ritz tea book is long on history and short on recipe testing, and unfortunately their English muffin recipe is no exception. I try to use what I already know about cooking to see the problem before it happens. In this case it was way too much liquid to dry ingredients. I did make two batches. The first batch of muffins had a nice appearance. Though large, they looked just like what you get at the store, but the flavor wasn’t quite there. Adding a bit of buttermilk made them tastier. As for the splitting and toasting of the muffin, I found it mattered only if you care about those famous nooks and crannies. If you cut your muffin with a bread knife, the buttered surface will be smooth. Using your fingers to open the sides of the muffin and carefully pulling it apart will give you lots of hills and dales for the nice color variances in toasting, and for the butter to run this way and that. *I know it’s a drag to look down a list of ingredients and see you have everything on hand but one slightly odd thing and that thing means a trip to the store as well as making room in your already cramped cupboards for something you will probably never use again. In this case it’s rice flour. More people might have rice flour on hand these days because so many are going gluten free, but I wouldn’t consider it common. You can use regular flour to dust your muffins, but if you want them to be exactly like what you get in a store you need rice flour. 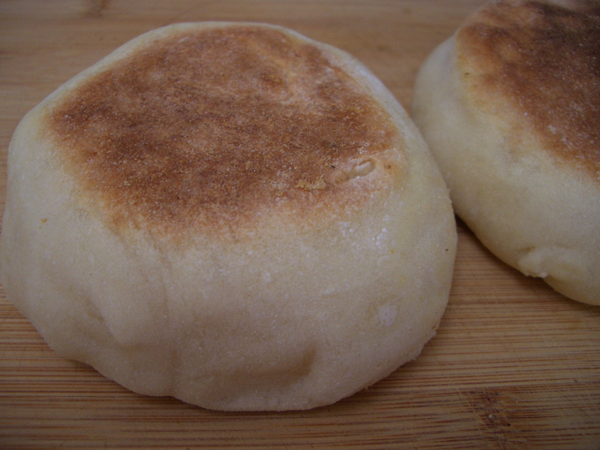 The sandy exterior feel to the muffin comes from rice flour. But again, don’t sweat it if you don’t have it. Using a stand mixer and the whisk attachment or a hand mixer, whip the butter until light and fluffy, about five minutes. Add the honey and whip until incorporated. Taste. Add more honey if you like it sweeter. Warm the water and buttermilk to tepid. Add the yeast, oil and sugar and let sit until frothy, about ten minutes. Make a well in the center of the flour mixture and add the wet ingredients. Stir to combine. Turn out onto a floured board, and knead until smooth and elastic. 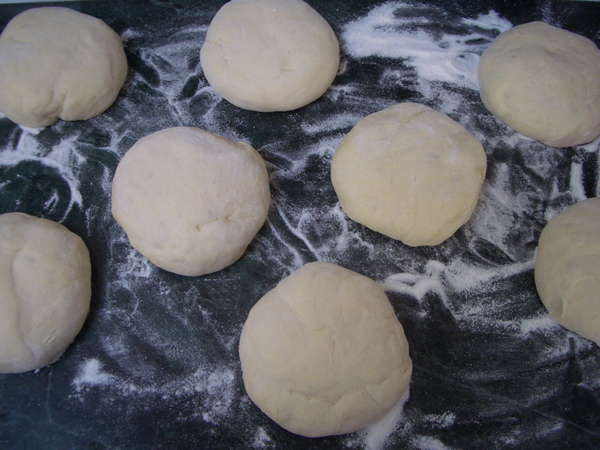 The dough might be slightly tacky but should not stick and leave residue on your hands. You might need to add a little more flour, but should not need much. 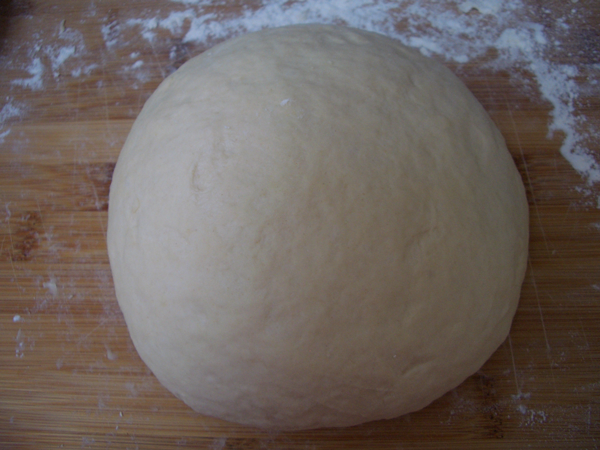 Put the dough in a clean bowl, and cover with a damp towel. 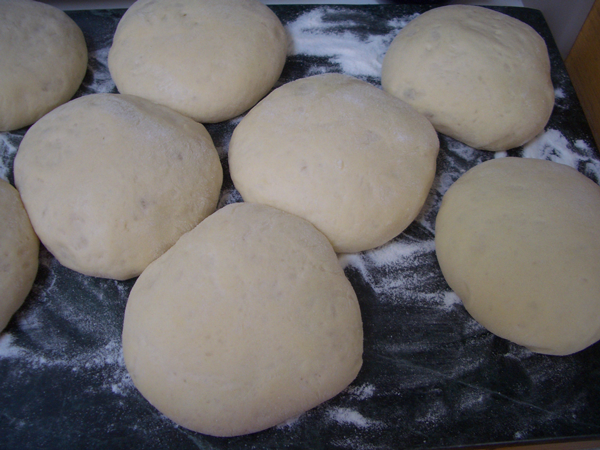 Tuck into a warm place and let the dough rise until doubled in bulk, about an hour. Turn the dough onto a board. Divide into either eight or twelve pieces. Roll each piece into a ball, dust with rice flour and place on another surface dusted with rice flour. Flatten the balls of dough down a bit with the palm of your hand. Cover the balls of dough completely with a dry towel and let rise for about 40 minutes until they double in size. 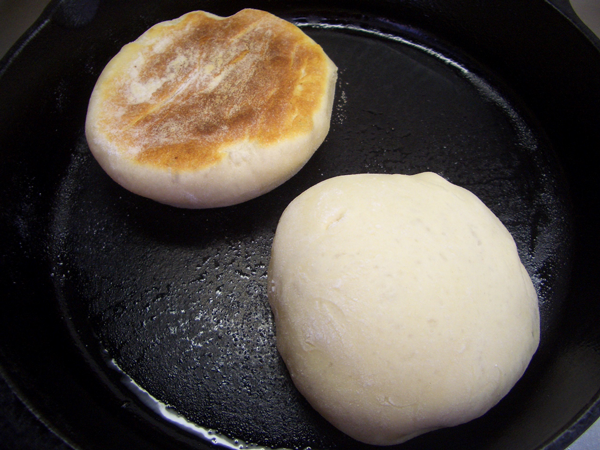 Heat a lightly oiled griddle, cast iron pan, or frying pan to medium heat. There shouldn’t be a lot of oil in the pan; you’re not frying the dough. Either lightly spray the bottom using a canned spray, or add a few drops and spread around with a piece of parchment or paper towel. Oh so gently… move the muffins to the pan (as many as will fit). They are very delicate and full of air. If you’re rough with them they will deflate. But don’t toss them if you crush one or two as they will puff back up when cooking, they just won’t be as nicely shaped. 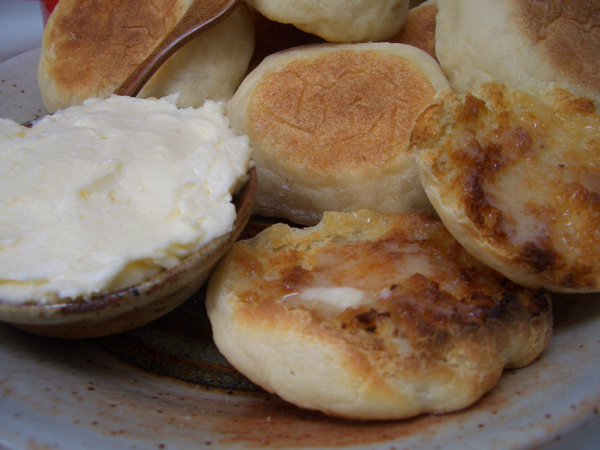 Toast the muffins and slather with the honey butter or your favorite spread. Uncooked muffins should keep in an airtight container for several days in the refrigerator or about one month in the freezer.